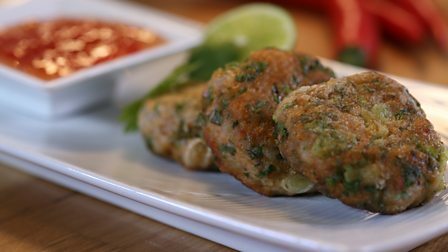 To make the crab cakes, put the crab meat, prawns, curry paste, cornflour and a couple of really good pinches of flaked sea salt and a few twists of ground black pepper into a food processor. Blend until well combined. You may need to remove the lid and push the mixture down a couple of times with a rubber spatula. Don’t allow the mixture to become too thin or smooth or it will be difficult to shape into crab cakes. Remove the blade and transfer the mixture to a large bowl. Stir in the spring onions and coriander until evenly mixed. 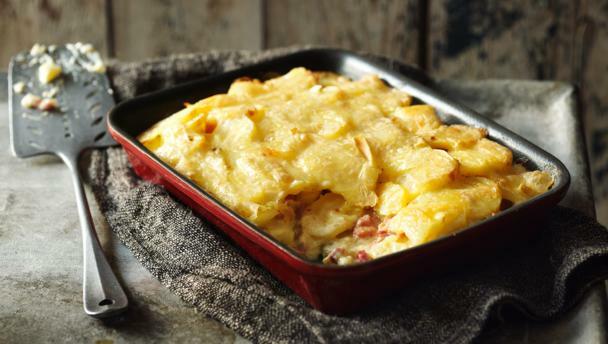 Sprinkle a small tray or platter with the extra tablespoon of cornflour. Wet your hands under the cold tap to stop the crab cakes from sticking. Take a small handful of the mixture – about the size of a golfball. Roll into a neat ball then flatten until around 1.5cm/¾in thick and 6cm/2½in in diameter. Place on the cornflour-dusted tray. Continue rolling and flattening the mixture until you have made 12 crab cakes. Pour the oil into a large non-stick frying pan and place over a medium heat. When the oil is hot, add six of the crab cakes and cook for two minutes on each side or until lightly browned and cooked throughout. Transfer to a warmed plate while the rest are cooked. Divide the crab cakes between two large plates or small platters. Add a dish of the chilli jam to each one and garnish with lime wedges and sprigs of fresh coriander to serve.